The best way for smaller retailers to survive is to join a large purchasing association and to compete with e-commerce by providing outstanding service. According to the German Statistics Office, non-food retail real turnover increased 3.5% year-on-year in 2017 – the eighth consecutive year of growth, and further expansion is expected in 2018. 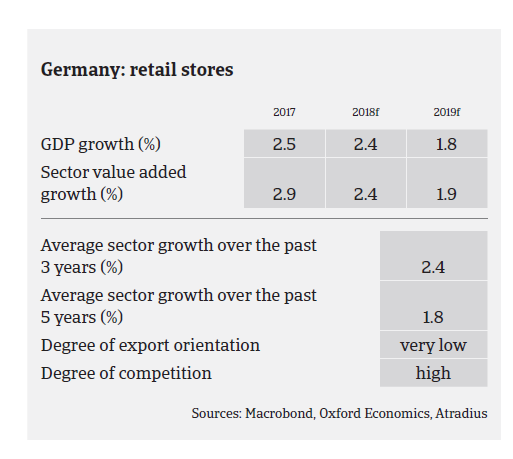 German consumer durables retail benefits from the country´s robust economic performance, with household consumption expected to rise 1.8% in 2018 following a 2.2% increase in 2017. Demand is driven by low unemployment and increased household purchasing power. However, rising consumer prices (expected to increase to 1.9% in 2018) could act as a brake on further spending. According to the German association of furniture industries BVDM, turnover in the furniture segment increased 0.5% in 2017, to EUR 33.6 billion, and in 2018 sales are again expected to record a modest increase. According to the German Electrical and Electronic Manufacturers' Association ZVEI, in 2017 manufacturers’ sales of large electric domestic appliances increased 1.5%, while manufacturers’ sales of small electric domestic appliances rose 3%. Smaller and mid-sized retailers are still struggling in their efforts to cope with the fast growing market leaders. At the same time, the competitive pressure from online retailers has further increased (in 2017 online sales of consumer durables grew 10.9%). In segments where e-commerce has rapidly expanded its market share (e.g. consumer electronics, electrical domestic appliances, furniture, leisure articles, clothing) competition is fiercer and the pressure on margins higher, which dampens the future prospects of mainly smaller brick-and-mortar retailers. The best way for smaller retailers to survive in this very competitive market is to join a large purchasing association and to compete with e-commerce by providing outstanding service, e.g. advisory services, easy return of goods, etc. In general, payment terms in the consumer durables retail segment range from 30 days to 60 days, however they can extend to more than 120 days depending on the market power of individual retailers. 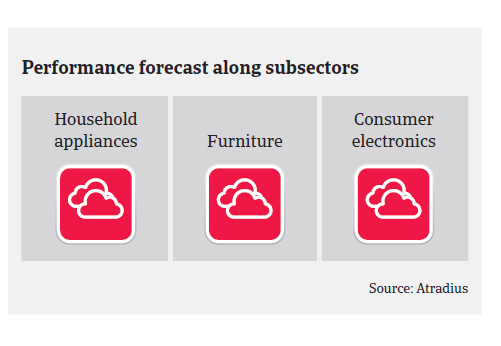 Payment behaviour in the German consumer durables sector has so far remained both good and stable, with a low share of protracted payments. 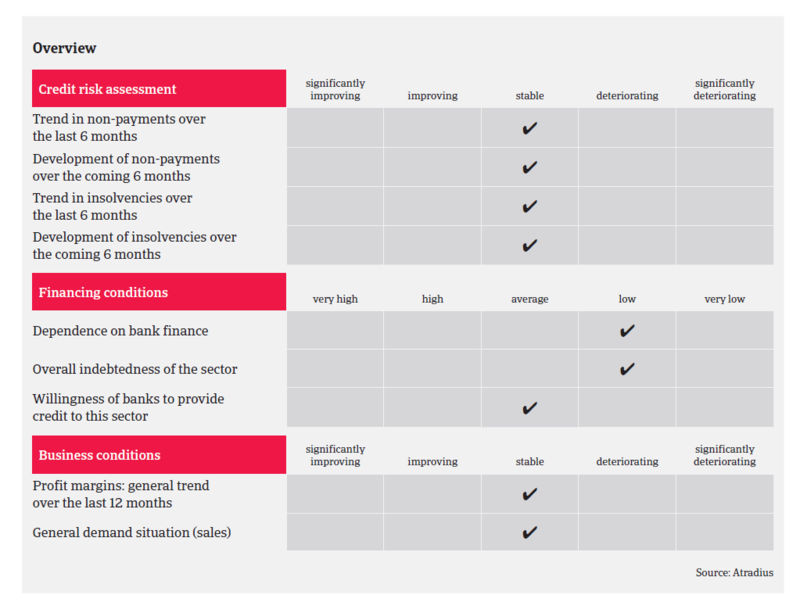 The sector´s insolvency level is average compared to other industries and it is expected that the number of consumer durables retail business failures will level off in 2018 compared to 2017. This is bucking the general business insolvency trend for 2018 (with a forecast 4% year-on-year decrease). 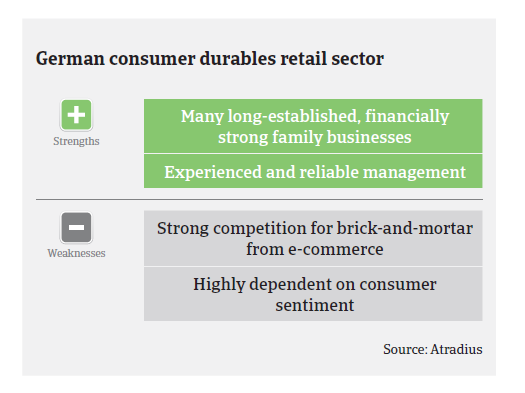 Due to the increasingly difficult situation of smaller players we still see consumer durables retail as a medium-risk sector. According to the retail federation HDE, 24% of the retailers with less than five employees expect higher turnover in 2018, compared to 80% of companies with more than 100 employees. We continue to closely observe the growing competition between online and brick-and-mortar retailers. In 2018 HDE expects a turnover increase of 1.2% for brick-and-mortar retailers, compared to more than 10% for online traders. Price transparency, made available to consumers by online retailers, maintains pressure on margins along the whole value chain. In segments with a steadily increasing share of e-commerce we try to obtain interim accounts in order to continuously check if buyers are able to keep sufficient margins. When businesses cannot pass on increased costs to customers/consumers or compensate for this with savings elsewhere, they might demand extended payment terms. We monitor payment behaviour closely in all subsectors and inform our customers immediately of any deterioration. We do not cover newly established firms during their first year of business unless they are members of a well-known group or have branched out from an established company. The German food sector has continued to grow in the first half of 2014. Domestically, there is increased competition caused by large retailers and discounters’ dominating market share.